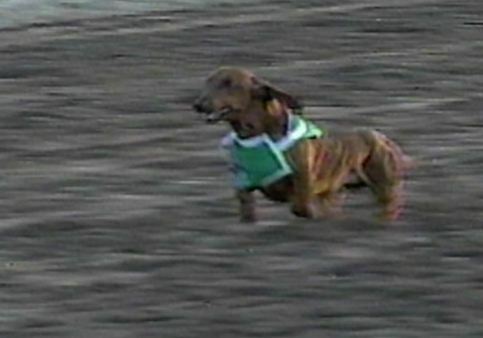 Baron the Racing Dachshund, Wiener Dog Racer Supreme! ever seen, and when he ran, he ate up yards and ground like it was nothing". 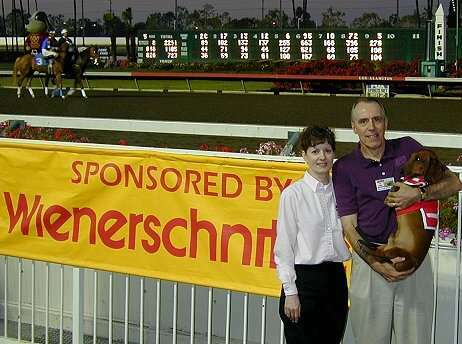 -Orlando Gutierrez, Los Alamitos Race Course (home to America's largest Dachshund race). "Baron's an all-time great who's considered the greatest in the history of the sport. competition with such efficiency that he was retired against his will by race organizers". 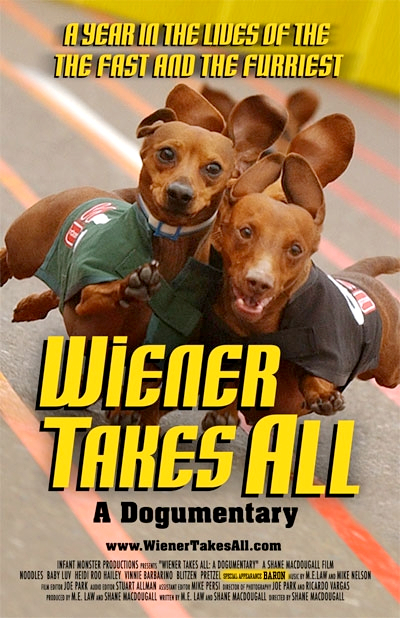 -Shane MacDougall, director of the movie "Wiener Takes All: A Dogumentary"
After enjoying a full life of love, fun, and achievement, Baron passed away peacefully at home on October 3, 2010. 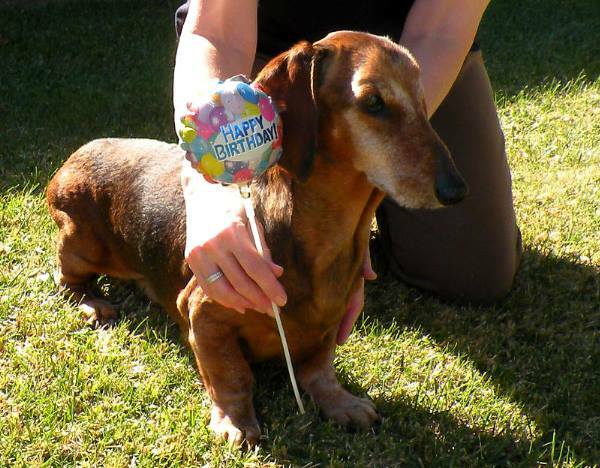 He lived for almost 18 years, the amazing equivalent of 125 human years old, making him a longevity champion too. This web page is a tribute to him and his many adventures. 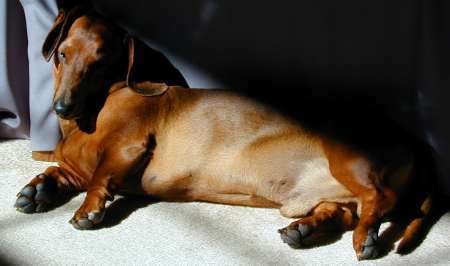 We hope you enjoy our memories of Baron, the Dachshund who loved running, racing, his family, eating, sleeping, and posing, not necessarily in that order. Baron was a bashful puppy who became a confident 35 pound racing phenom after discovering how fast he could run. He aged gracefully over the years. He was running fast enough to win Wienernationals events at 14 years old, and was still able to run in short bursts after his 17th birthday. There is no doubt that the strength he gained from running, and his happiness while doing it, helped him live a long and joyful life. To those of us in his family, Baron's biggest achievement was being a wonderful pet, friend, and companion for so many years. We continue to receive email for him, from around the world. He was loved by many, and will be missed. 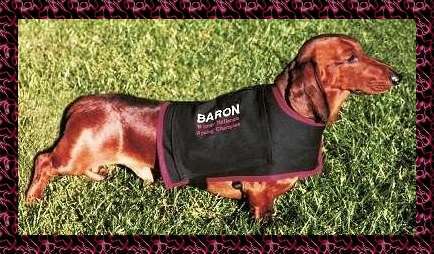 Click here to send an email about Baron..
VIDEO CLIPS: Click a link to view! Following are Baron's "dog career" highlights in chronological order: enjoy! 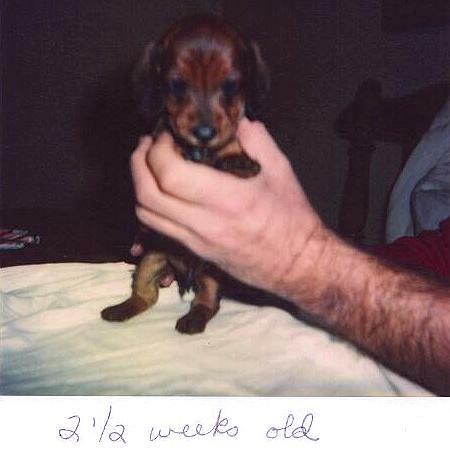 Let's kick things off with a picture of the World's Fastest Dachshund when he was only 2-1/2 weeks old. 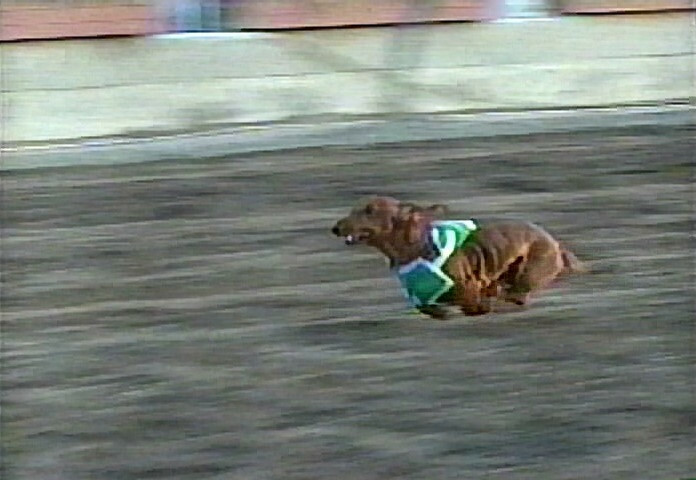 Baron charged through a field of 64 Dachshund finalists to win the Wienerschnitzel Wiener Nationals at Los Alamitos Race Course! There were 255 entries, with 64 qualifying for the finals. His "booty" included a $500 cash prize to buy lot's of dog snacks, a beautiful etched glass trophy, and a media tour for Wienershnitzel. He was fast qualifier, and "crushed the field with a powerful run" according to the track announcer. Baron ripped his saddle cloth partially off during the race, and then ran hard despite having his legs tangled in it for most of the race. Film of the event was featured on various Los Angeles television stations and Hard Copy on Monday June 16th. 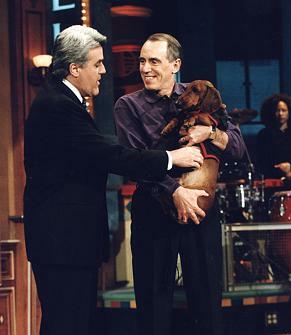 Baron subsequently appeared on the Tonight Show with Jay Leno on Thursday June 19th, where he won the Tonight Show race on stage. 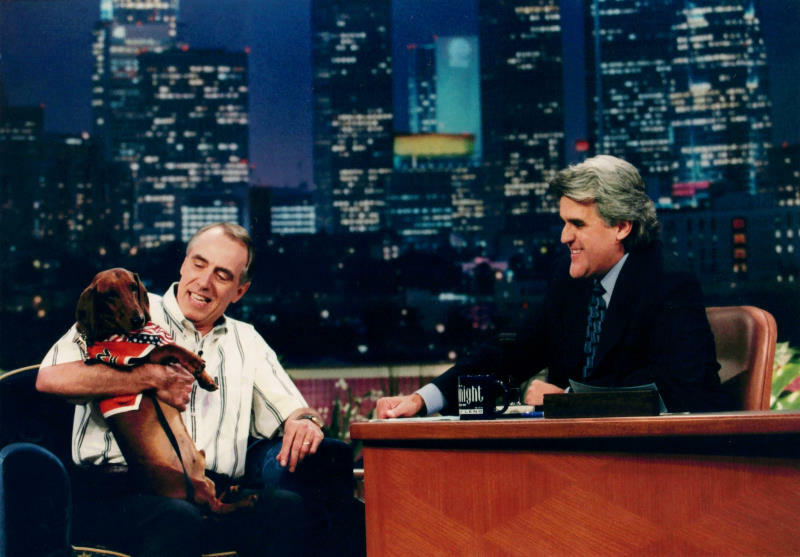 June 16, 1997: Baron appears on TV show "Hard Copy"
June 19, 1997: Baron makes his first appearance on the Tonight Show with Jay Leno! 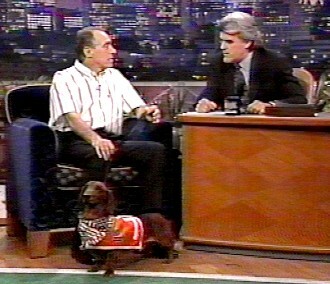 Baron, the dog celebrity that he is, appeared on the Tonight Show on Thursday June 19th along with Ron Rowland, his dog daddy. 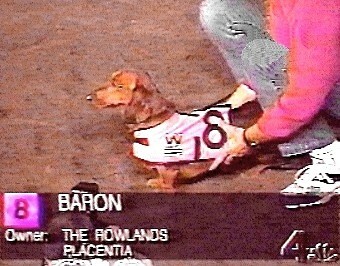 Baron was "interviewed" by Jay on stage and had a short match race against 5 other Dachshunds from the race. 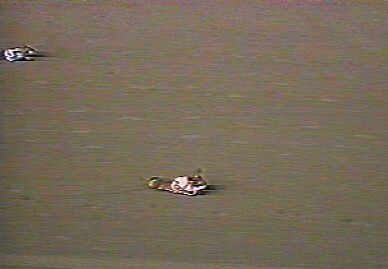 The "race" was only a 20 foot romp across the stage instead of the usual 50 yards, with the last half spent slowing down. Although Baron is as fast as any at the start, he usually dominates the second half of a 50 yard race. Baron won the first Tonight show run in a close photo finish with last years champion, Pea-Nut second. Jay then set up a 2nd race with just Baron and Pea-Nut, which Baron won by a nose. Pea-Nut, who starts very quickly, finished 4th at this year's Nationals. 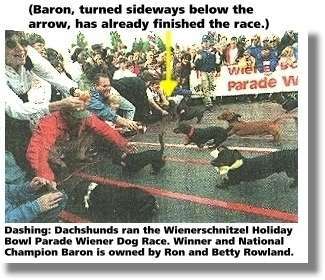 December 29, 1997: Baron wins the Holiday Bowl Parade Championship Race! Baron streaked down the San Diego pavement in front of 100,000 parade spectators for his latest victory! 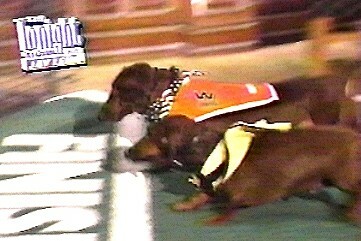 The nationally televised race, sponsored by Wienerschnitzel Restaurants and PetSmart, was held before the start of the Holiday Bowl Parade. In addition to scoring a host of doggie goodies for the victory, he also earned a ride on the Wienershnitzel Restaurants float, and thoroughly enjoyed waving to his fans along the way. 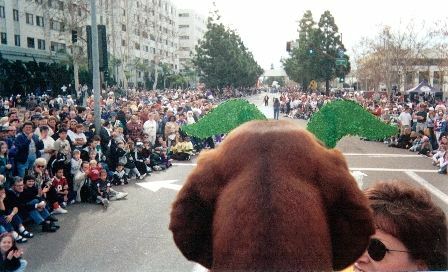 The picture above, taken along the parade route, shows Baron's "dogs-eye" view from the top of the float. 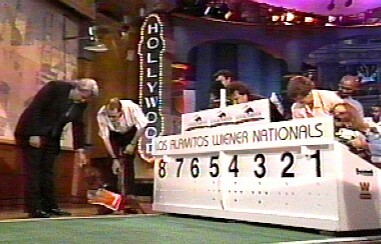 The 9 Dachsie's who challenged Baron in the final were determined by qualification races at 3 Wienerschnitzel locations. 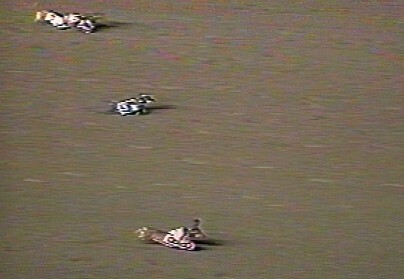 To Baron's disadvantage, the race was shorter than the advertised 50 yard distance that he had prepared for, and with people crowding the finish line, it was tough, but he led wire to wire to remain undefeated. Go Baron, GO! February 22, 1998: Baron Appears on NBC's "Fred Roggin's Sunday Night Sports"! 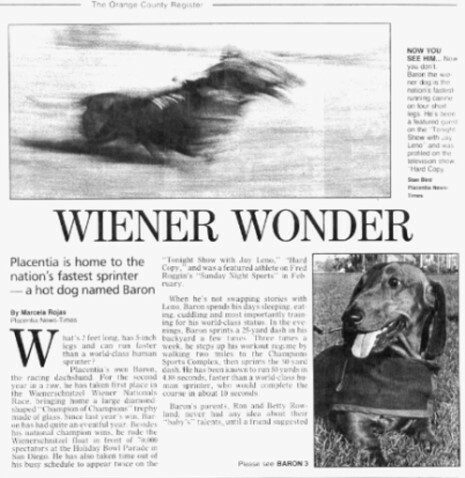 Saturday May 30, 1998: Baron Wins Wienernationals "Champion of Champions" Race! 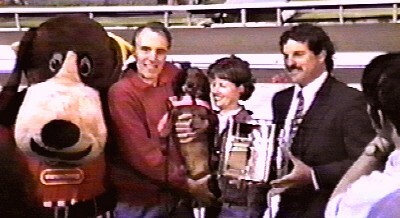 After winning the Holiday Bowl, the Tonight Show wanted to spoof Baron's racing by matching him and other Dachshunds against racing pigs, (yes, racing PIGS). Unfortunately, Baron tried to break into the pigs dressing room. 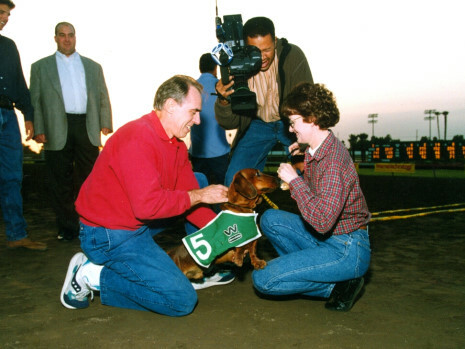 Baron returned to California's Los Alamitos Race Course on June 12th 1999, and successfully defended his 1998 Champion of Champions title by winning the 1999 "Ultimate Match Race". 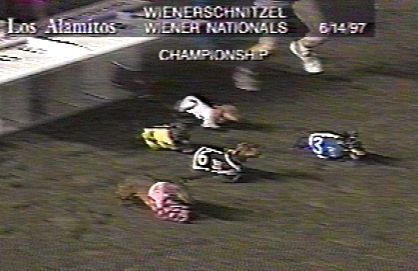 After Baron won the 1997 Wienernationals by a wide margin, track officials changed the rules. 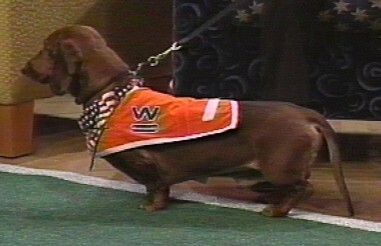 In 1998, Baron was excluded from Wienernationals eliminations and competed instead in a "Champion of Champions" race that matched him against prior champions and the Wienernationals eliminations winner that night. 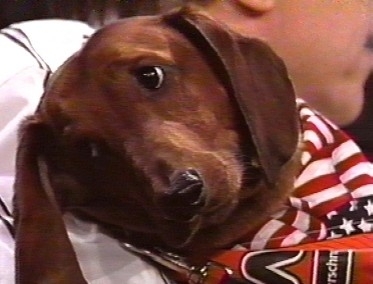 This year that format was refined to match Baron heads-up against Jesse, the 1999 Wienernationals Champion. To earn the right to face Baron, Jesse had to defeat a 64 dog field consisting of 8 dogs in 8 elimination races. In an excellent race, Baron started slightly behind, caught the quick Jesse by mid-race, then used long, powerful strides to stretch his winning margin to 4 lengths at the finish. The "Ultimate Match Race" was run for charity, with SuperCar Specialty, Blakes Place, and Los Alamitos Race Course combining to donate $500 to the Children's Hospital of Orange County's Caring K-9's program. The Caring K-9's program, which depends on donations for it's survival, provides specially trained dogs to lift the spirits of hospitalized children. We are proud to assist this worthy cause. 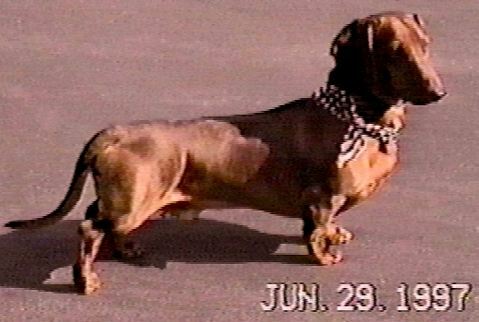 August 14, 1998: Baron Appears in Animal Planet Network's "Amazing Tails"
October 18, 1999: Baron Appears in Animal Planet Network's "Breed All About It"
Baron the Racing Dachshund has announced his retirement after a stellar 4 year "racing career". His racing titles include 1999 Ultimate Match Race Champion, 1998 Champion of Champions, 1997 Wiener Nationals Champion, and 1997 Holiday Bowl Racing Champion. Baron’s ability to run 50 yards faster than a world class human sprinter amazed everyone, and is no easy feat considering that his legs are only 4 inches long! 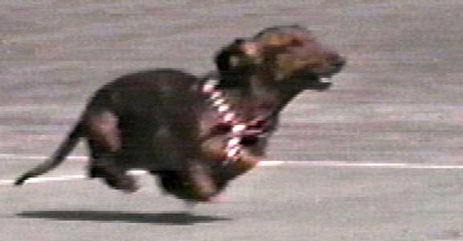 He has run 50 yards in only 4.22 seconds, the fastest ever by a Dachshund, and has never had a close race at that distance. Baron is retiring because Los Alamitos Race Course no longer allows him to compete in the Wienernationals, due to his dominating performances there. 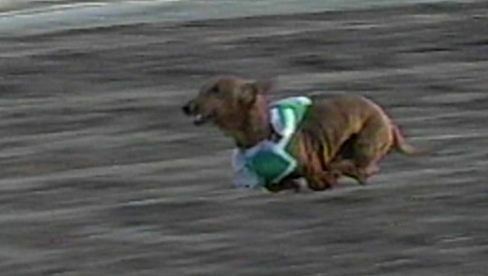 Says Jeff True, Los Alamitos Marketing Director: "He’s just too much dog for the competition". His media adventures include two appearances on NBC’s "The Tonight Show with Jay Leno", plus appearances on "Hard Copy", Animal Planet Network’s "Breed All About It" and "Amazing Tails", NBC’s "Fred Roggin's Sunday Night Sports" and various news and sports programs. He has twice received Certificates of Accomplishment from the Mayor of Placentia, and raised money for the Children’s Hospital of Orange County in a 1999 Charity race. 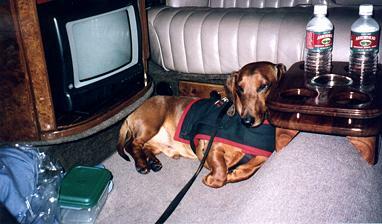 Baron is now enjoying a "dog-gone-easy" retirement, and enjoys receiving email from his web page. (Background: according to Jeff True, Director of Marketing for Los Alamitos Race Course, Baron will no longer be allowed to race there. 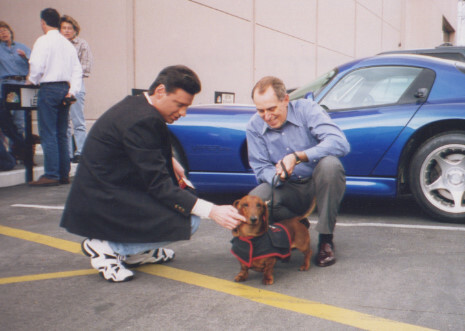 Jeff has refused Baron entry into the Wienernationals since 1997, saying that he is "just too much dog for the competition", that his winning every year isn't "good for publicity", and that both Los Alamitos, and the media,"want something different every year". 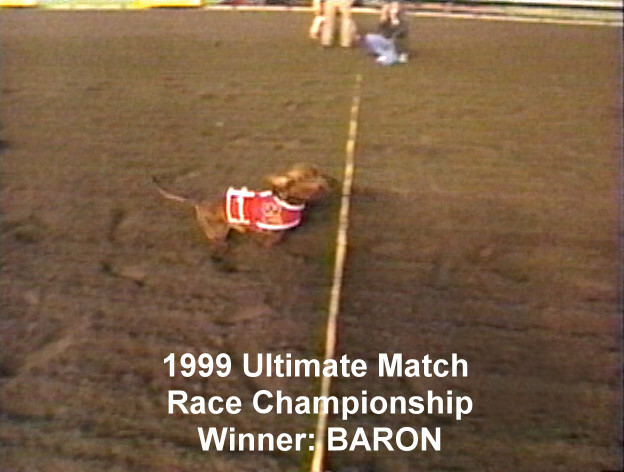 So in 1998 and 1999, Baron was featured in match races against the Wienernational "Champions" instead, all of which he won easily. Participants, fans, and the press have never been told that Jeff has been keeping the fastest past champions, including Baron, from racing in the Wienernationals. As one track worker said: "It would be embarrassing if people knew they are keeping the best ones out". All good things must end eventually. Although Baron has had great fun racing, it's a blessing that he retires healthy and happy after never losing a Championship race or having a close race. Baron was a big baby at home, unless he was in watchdog mode, but his real passion was always running. If he knew it was time to practice or race, he got so excited that we could hardly hold him. His biggest achievement had nothing to do with racing: the great companion and friend he was to us for almost 18 years, was his best gift to us. 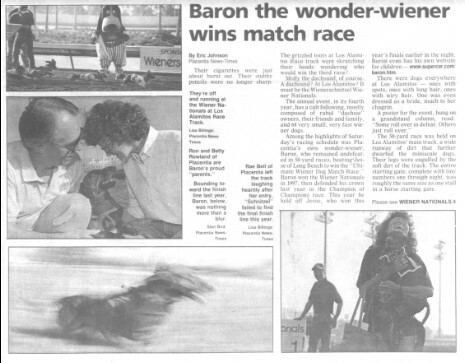 Baron stars in "Wiener Takes All"
Baron made a special appearance in the Dachshund racing movie, "Wiener Takes All, A Dogumentary", which is currently being shown throughout the United States and Canada. 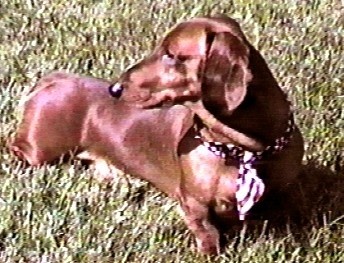 Baron, who was "interviewed" for his cameo appearance, was recognized as a Dachshund racing legend and the best of all times, by several experts in the movie. 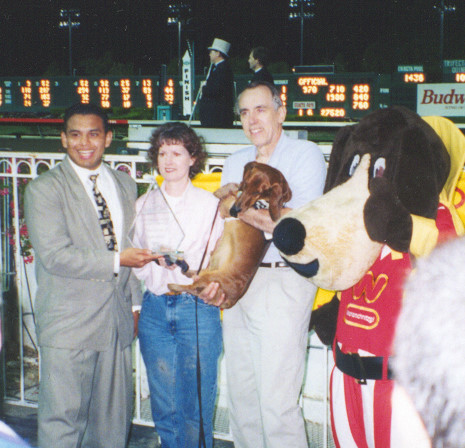 Said Lee Moskowitz from Florida: "Baron, of course, has to be considered the greatest racing Dachshund of all time. He was a freak, a 34 pound monster". Although Baron has passed away and is no longer with us, we will continue to add to his memories by updating this page with additional information, pictures, and videos as we come across them. Thank you for your interest in Baron, he will never be forgotten. 1999: "Breed All About It"